There is a unique space at Queen’s that has made it the hub of ecological research and innovation – the Queen’s University Biological Station (QUBS). QUBS has had a dual mandate of teaching and research for the past 70 years. Led by QUBS Director and Professor Stephen Lougheed and Associate Professor Yuxiang Wang, the fieldwork accomplished at QUBS is not only important for the internationalization of Queen’s but the results of the fieldwork can truly change our planet. Ying Chen studied at Tongji University in Shanghai and transferred to Queen’s to complete a Bachelor of Environmental Science at Queen’s. Her interest in biology was sparked by a field course trip to QUBS in 2012. 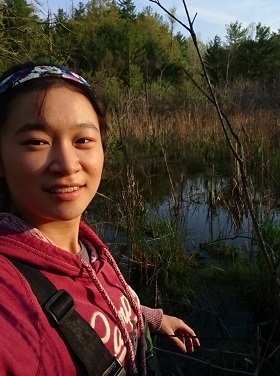 She felt encouraged to volunteer in the lab and is now working on her Master’s project, which uses the amphibian call to evaluate the quality of aquatic habitat. “My worldview has been impacted in terms of the relationship between humans and their environment. My sense of responsibility to protect the environment as a citizen has increased.’ – Ying Chen (ArtSci’17). Your gift to the Queen’s Fund makes a difference. We learn from each other and our planet. These opportunities lead to innovation.